A great rest point near the suspension bridge over Neretva. 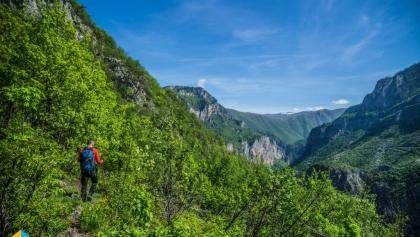 This hiking trail connects Boracko lake with Lukomir village along the canyon of Rakitnica. It offers great views of an impressive canyon and brings you to old Bosnian villages. This section starts at Boracko lake and follows road to Glavaticevo for the first few kilometers. It crosses a suspension bridge over Neretva river and passes village Kasici on its way up to Sibenik and Kom rocky hills. Then it passes around below Sibenik and descends down to Rakitnica river to its confluence with Neretva. If you plan on hiking this trail in two days, you can climb up Kom summit (left on T junction, close to Podkomlje village) where a medieval castle used to be located. 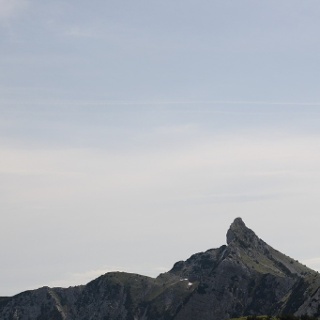 From the confluence, the trail climbs up towards the cliffs of Cepa and passes on its other side offering great views on Ostro (the Sharp) pinnacle and canyon. A little later it comes above the village of Dubocani situated bellow the great Crows’ Rocks (Vranske stijene). It joins the road above the village, and follows it for the next couple of kilometers where it moves over pastures and ends in the oak and beech forest. In the forest, it goes straight up over pathless terrain and comes to the plateau above Crows’ Rocks. It passes by an old shepherd settlement (katun) where an elderly couple still graze their sheep flock and cultivate their garden in a very traditional way. 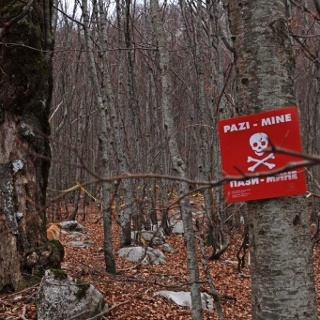 The trail leaves the edge of the canyon and goes through the forest which ends in open pasture lands of southern Bjelasnica. The ruins of Blace village are located close to the edge of the Rakitnica canyon. It reminds us of the horrors of the last war in this beautiful country. The lake named after the village (or was it the opposite?) is just behind in the oval valley. It is already being consumed by swamp vegetation where some wetland bird species can be spotted. 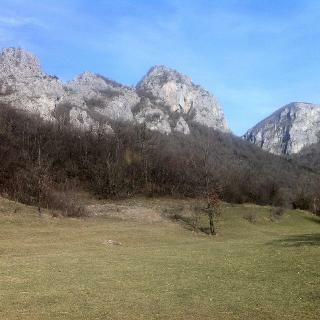 From Blace, the trail climbs up to Markovac and Lisac summits. On the other side of the canyon you can see Dzamija (the Mosque), which is the highest summit of Visocica mountain with its 1967 m. The trail will follow the edge to the beech forest, will move for a bit inside the wods, and then back to the canyon, now crossing the southern slopes of Mount Lovnica. 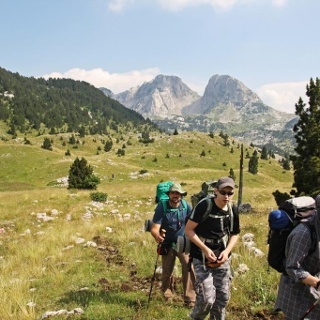 Around Lovnica, trail brings you to the highest Bosnian village – Lukomir. This stage ends here. 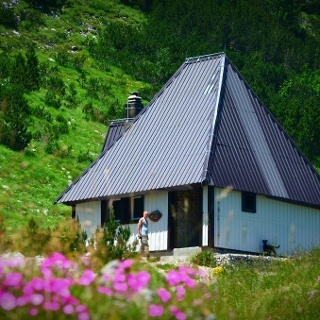 Here you’ll have a chance to experience life as it was once upon a time all over the Bosnian and Herzegovinian highlands, but also how civilization is easily taking over. Ask your host at Boracko to give you a ride to the suspension bridge on Neretva. This saved hour will mean a lot later on in this long hiking day. As water is available mainly from wells, a water filter is recommended. If you take this stage in two days, camping equipment is needed. Follow the asphalt road towards Glavaticevo. After Bukovica cottages, you will find a suspension bridge over the Neretva. Cross the bridge and follow the road on the other side which will bring you to Kasici village. In Kasici, turn right and follow the track going uphill passing by the cemetery. At the top (T junction), go left and follow the trail down to Rakitnica bridge. When approaching confluence, keep right and get to the view point above the confluence. Now trail goes up, crosses the ridge and follows the eastern slopes of Cepa towards the north. When you join the road, go left and on the pass continue on the road going right uphill. Follow the road till you reach a somewhat rocky pasture and leave the road at this point. The trail now goes along the forest or bush line which is the border of the pasture lands. This will bring you to the point where the trail turns right into the forest, and through the forest up to the plateau. From now, the trail mainly follows the canyon edge, sometimes moving away but coming to the edge again. After descending from Lisac, and getting to the beech forest a couple hundred meters away from the edge, you need to go right in order to re-join the canyon and the trail leading to Lukomir. When in the village, just go up to the central location and there is a water fountain and small restaurant / bar. The next stage of the trail starts at the south-eastern corner of the village close by the Stecci necropolis and guesthouse. 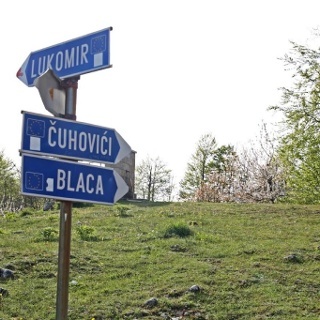 Turn left in Konjic and follow the signs to Boracko lake. If not hiking from the previous stage, drive straight to the suspension bridge. The first few kilometers of asphalt road do not make for a pleasant hike. It is possible to park by the suspension bridge. Also, parking can be found at Boracko lake. We are on the trail at the Voda sign for the well at 991 meters, above Dubocani. It's a cave and you have to crawl down the cave to get some water at the bottom. Not easy. (especially getting out) Also someone lost their car key there. I left it on the trough. Trail is now excellently marked and in good state. And bridge over Rakitnica has been repaired. 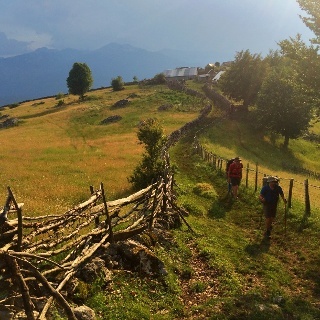 We took rest in Dubocani (bit off trail) and got water from locals. There are some water sources also after this. We camped bit after Vranske Stijene. Trail between Blace and Lukomir marked, but difficult so expect slower progress.